Ready to take the next step in your career . . . but not sure what's holding you back? Read on. Leadership expert Sally Helgesen and bestselling leadership coach Marshall Goldsmith have trained thousands of high achievers--men and women--to reach even greater heights. Again and again, they see that women face specific and different roadblocks from men as they advance in the workplace. In fact, the very habits that helped women early in their careers can hinder them as they move up. Simply put, what got you here won't get you there . . . and you might not even realize your blind spots until it's too late. Sally and Marshall identify the 12 habits that hold women back as they seek to advance, showing them why what worked for them in the past might actually be sabotaging their future success. 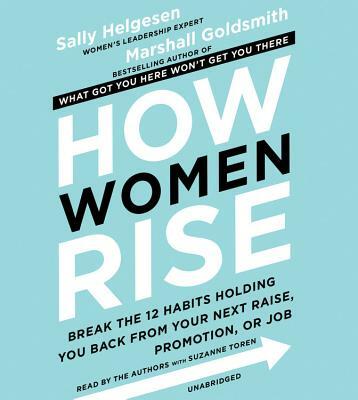 Building on Marshall's classic best seller What Got You Here Won't Get You There, their new book How Women Rise is essential reading for any woman who is ready to advance to the next level. Sally Helgesen's work is widely regarded as the gold standard when it comes to women's leadership. Since the publication of The Female Advantage in 1990 (still in print), she has written five more books in the field and speaks to audiences all around the world about these issues. Clients have included Microsoft, IBM, Johnson & Johnson, Prudential Financial, Pfizer, Textron, Hewlett Packard, The World Bank, and dozens more. She has led seminars at the Harvard Graduate School of Education and Smith College, and her work has been featured in Fortune, The New York Times, Fast Company, and Business Week. She lives in Chatham, New York. Marshall Goldsmith is America's preeminent executive coach. Marshall's What Got You Here and Triggers are both ranked by Amazon in the Top 100 Best Books of all time in the leadership and success category. What Got You Here, Triggers, and MOJO were all The New York Times best-sellers and Triggers hit #1 on The Wall Street Journal's best-seller list and was chosen by Amazon as the Best Business Book of the year when it was published in 2015. What Got You Here won the Harold Longman Award for the Best Business Book of the year. Read those chapters, commit to one of the suggestions, and you're on your way. understand that in the shadow of their strengths lurk silent career killers. careers. This is a must read with great actionable advice! "—Janice Reals Ellig, Chief Executive Officer of Chadick Ellig and one of BusinessWeek's "World's Most Influential Headhunters"